I wouldn't necessarily call all of my electronics work my own creations; many of the amps and preamps were existing circuits or kits that I may have modified the parts list or made a few minor circuit changes. As enjoyable as it is to build them, it's preferable for me to stick with tried and true circuits created by the experts and not come up with new schematics of my own volition. There tends to be more enjoyment in the final presentation, the color scheme and the chassis work and even the way the inside looks. A number of people have told me that my builds have a Steampunk look to them. I'm familiar with the movement, and I wasn't even aware of the fact that my design choices tend to follow that look, but perhaps was subconsciously making the design decisions with Steampunk as an inspiration. 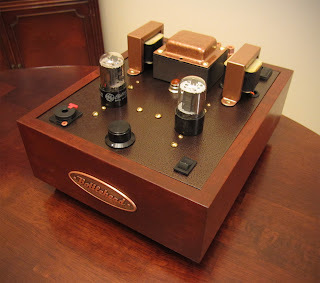 I suppose my designers manifesto is that I feel that amplifiers with older technology like vacuum tubes should have a vintage look and patina, even if they are being assembled in the 21st century. 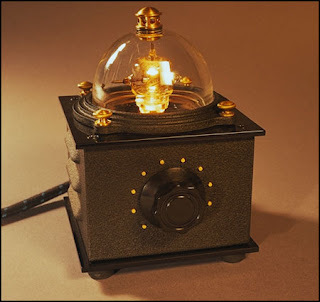 Vintage has a different look for different people, but I tend to think of copper and polished brass, gold plating, brown and copper hues with a crinkled / hammered texture, wood and metal grating and leather. These seem to be the same facets that find themselves in the psuedo-Victorian era Steampunk movement of design. I'm not sure that future projects will have the telltale brass gears and non-functional pipes that Steampunk gear tends to have, but I may think up other embellishments as time goes on. I think that the main inspiration for vintage electronics was a company called Moth Audio that produced a number of designs from 1996 to 2007. 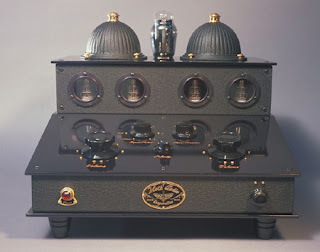 There are many purveyors of audio gear that make really beautiful work, but in my minds eye, the aesthetics of Moth Audio gear is second to none. Craig Uthus was the head of Moth and at the time, the work was considered to be "retro-styled", the designs were highly distinctive and still highly sought after today. Craig's partner at Moth was Joel Marshall, a Hollywood prop designer, who designed the beautiful chassis you'll see below. There is at least a few audio builders out there that fully embrace the Steampunk aesthetic; Aevil at Coppersteam Labs put together the best looking S-5 Electronics K-12G I've ever seen. I'd imagine there's more money invested in the copper than the amp itself, it's a real beauty that looks like it came right out of Bioshock. I also found a lovely "effect-pedal" if you will made by Peter Groenewoud at Hilltree Productions called the Steampunk Doomsday Machine. The top features two 230V DC bulbs that carry the music signal and create the effect. 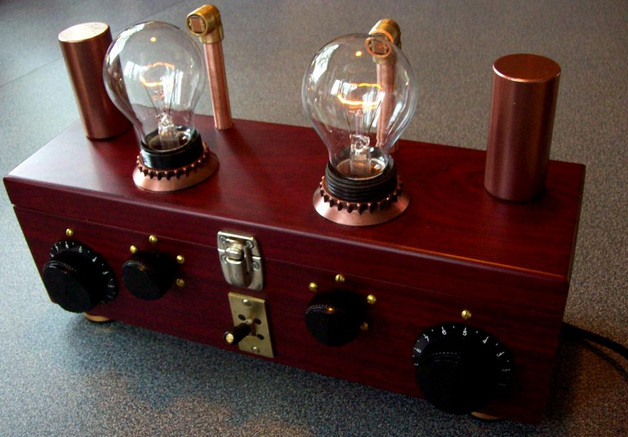 Lots of wood, brass and copper in this Steampunk design. Peter will not share a schematic on this device as the 230V DC going across those lightbulbs is fairly dangerous. Also, a new addition after the 2012 Bay Area HeadFi Meet was Frank Cooters amazing looking headphone amplifier. 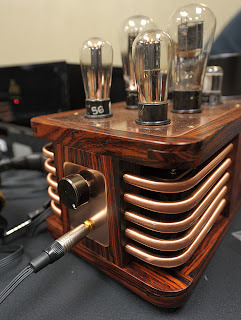 I don't know too many details about this one, but the glorious copper piping and top-plate and nicely figured hardwood really set this apart from other builds. Evidently all the work inside this beast is point-to-point, and Frank has a matching one that powers electrostats. In this photo it looks like someone has an Audeze LCD-2 headphone plugged in. In conclusion, I'm not sure that my builds are Steampunk. They may look like it to a certain degree, but it's nebulous where the line of vintage and Steampunk merge, intersect and share common facets. What do you think? 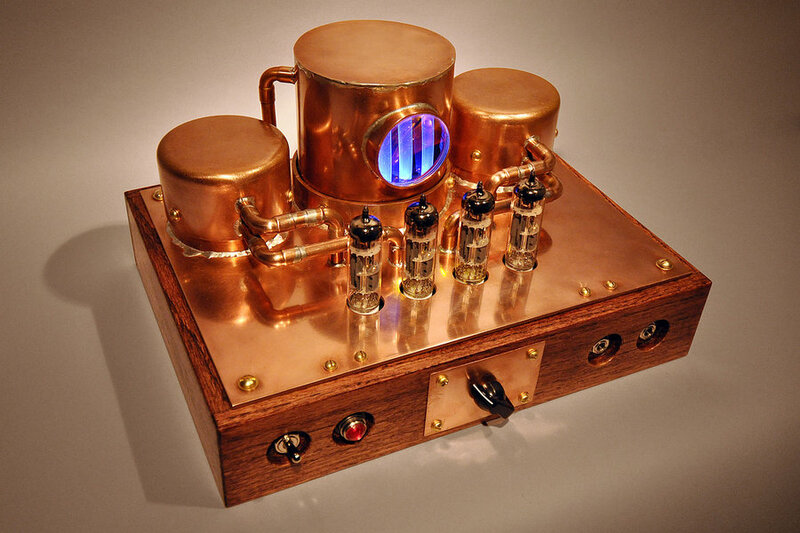 Looking for some steampunk-esq audio cables and equipment? Contact your friends at Zynsonix Audio.